Almonte (pronounced "AL-mont" as opposed to the original Spanish pronunciation of "al-MON-tay") is a former mill town located in Lanark County, in the eastern portion of Ontario, Canada. 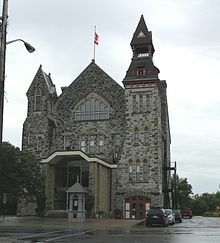 Formerly a separate municipality, Almonte is now a ward of the town of Mississippi Mills, which was created on January 1, 1998 by the merging of Almonte with Ramsay and Pakenham townships. Almonte is located 46 kilometres (29 mi) south-west of downtown Ottawa. Its population as of 2013 is about 5,000. Almonte's first European-bred settler was David Shepherd, who in 1818 was given 200 acres (0.81 km2) by the Crown to build and operate a mill. The site became known as Shepherd's Falls. That name was never official, however, and Shepherd sold his patent after his mill burned down. The buyer of the patent, Daniel Shipman, rebuilt the mill and the settlement became known as Shipman's Mills by about 1821. The majority of Shipman's Mills' early settlers were Scottish and later Irish. A textile town almost from the start, by 1850 it was the home of seven busy woolen mills of Messrs B & W Rosamond. It was one of the leading centres in Ontario for the manufacture of woollen cloth. The construction of a railway line to Brockville stimulated the economic growth of Almonte. 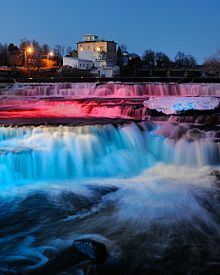 In 1869, Almonte was a village with a population of 2000 situated on the Mississippi river in the Township of Ramsay, County of Lanark. It was a station of the Brockville and Ottawa Railway. By the 1870 the town had thirty stores and forty other businesses. During this time of rapid expansion the town changed its name from Shipman's Mills to Ramsayville, and then to Waterford. When in 1855 the newly created Canadian post office pointed out there was already a Waterford in Ontario, the town needed yet another name change. Relations between the United States and Great Britain had been antagonistic since the Revolutionary War and later the War of 1812. Border wars between Mexico and the United States in the 1830s increased this antagonism. Mexican general Juan Almonte had fought honourably in these latter wars, and by 1853 had become Mexico's ambassador to the United States. 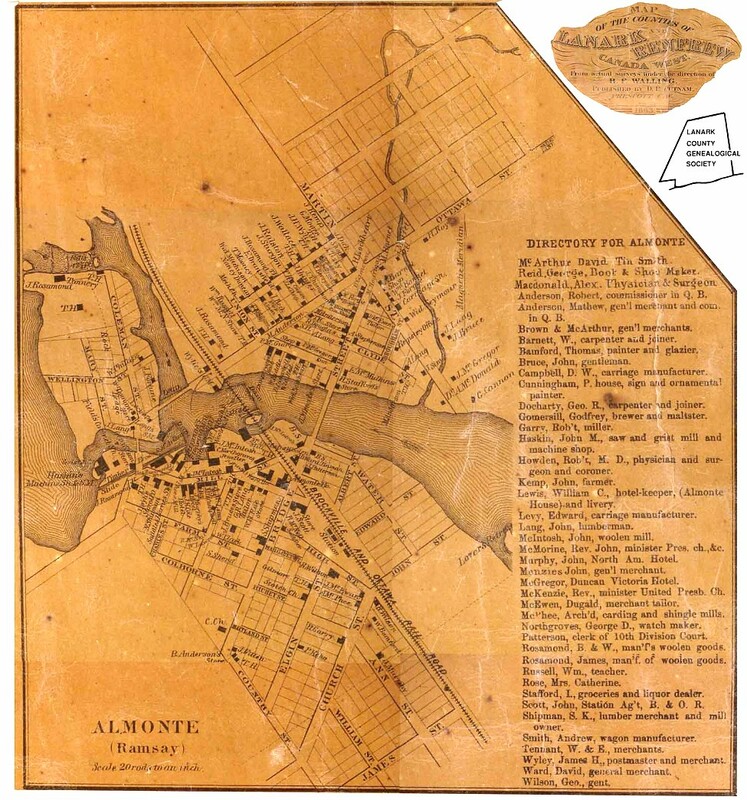 In the ensuing climate of Canadian mistrust of American territorial ambitions, General Almonte's name would have been well known to Waterford's citizens. Though there is no decisive evidence as to the final motive for the name change, it appears likely that Waterford saw Almonte as a "principled David fighting a Goliath interested in swallowing up all North America." The proposed name change was accepted by the Combined Counties of Lanark and Renfrew in June 1855, although the post office didn't record the new name until 1859. Whenever the name may have been formally accepted, it led to Almonte being the only community in Ontario, and likely Canada, to be named for a Mexican general. Almonte has a skate park and splash pad which is open to the public and is located at the arena. The Puppets Up! International Puppet Festival was held annually in Almonte. The 2017 edition was cancelled due to "steady decline in all revenue streams". The Festival attracted puppet performers from various parts of the world. The 2009 Festival included acts from Canada, the U.S. and Iceland. The Festival also featured buskers, musicians, clowns, magicians and dancers. The festival's artistic director is the acclaimed Canadian puppeteer Noreen Young. The Almonte Celtfest has been held annually in Almonte's Gemmill Park since 1997. The festival's goal is to "celebrate and promote the Celtic heritage of the Ottawa Valley through music and dance." ^ a b c d Cosentino, Frank. (2000).Almonte: the life of Juan Nepomuceno Almonte, pp.4-5, General Store Publishing. ^ Former Almonte Post Office. Canadian Register of Historic Places. ^ Rosamond Woollen Mill. Canadian Register of Historic Places. ^ "2017 Festival cancelled – PUPPETS UP !". puppetsup.ca. Retrieved 2017-05-31. Wikivoyage has a travel guide for Almonte. 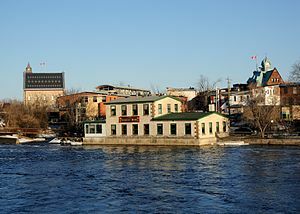 Wikimedia Commons has media related to Almonte, Ontario. This page was last edited on 3 January 2019, at 22:50 (UTC).